Ford had been admitted to hospital last week. 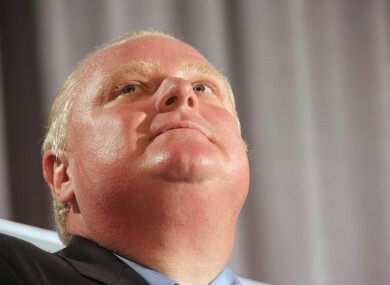 TORONTO MAYOR ROB Ford has been diagnosed with a malignant tumour. Ford will undergo chemotherapy to fight the tumour, his doctor said today. His diagnosis follows a week of hospitalisation and tests, which led him to leave his re-election campaign and to focus on his health. The 45-year-old mayor only returned to work in June after two months in rehab for drug and alcohol abuse, including the use of crack cocaine. He was admitted last week to hospital with abdominal pains and a battery of tests showed Ford has malignant liposarcoma, doctor Zane Cohen told a press conference. Over the coming months, Ford will have a cycle of three days of chemotherapy to try to shrink the “relatively large mass,” which measures 12 by 12 centimeters, followed by 18 days of rest, Cohen said. Doctors will then reassess the cancer. Further chemotherapy, radiation or surgery may be required, he said. Ford garnered global notoriety for smoking crack cocaine in a “drunken stupor” while in office. It was announced last Friday that Ford’s brother city councillor Doug Ford is to take his place on the ballot paper. The election is scheduled for 27 October and two other major candidates are still in the running, as well as Doug Ford. Email “Toronto Mayor Rob Ford diagnosed with rare and aggressive cancer”. Feedback on “Toronto Mayor Rob Ford diagnosed with rare and aggressive cancer”.